Rex was my best friend and constant companion for many years. He herded the goats on my farm and was in charge of security letting me know when anyone arrived on the property. He never bothered the chickens or other stock. He moved to Alberta with me and then, eventually, back to Nova Scotia. He loved driving in the truck and acted as though it was his truck & I was his driver. I miss him terribly. Rest in Peace my wonderful old friend, you will live forever in my heart. Nancy, first of all let me take the time to tell you how sorry I am for your loss. It is so very hard to lose a wonderful pet German Shepherd. But your memories will help you through it all though and your memories will stick with you forever and help through the long grieving process. 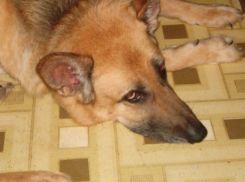 Thank you again for sharing your story about your German Shepherd Dog, Rex, here with us all at Total German Shepherd. We all grieve along with you.